Hysteria is a term which is used to describe people that are affected by uncontrollable excitement, fear, or anxiety. Many a time, it remains infectious causing lots of people to suffer from similar symptoms. In this post, we have covered mass hysterical events that sound very unusual and eerie. While some of them have many possible explanations for the outbreaks, most of the events remain unexplained. 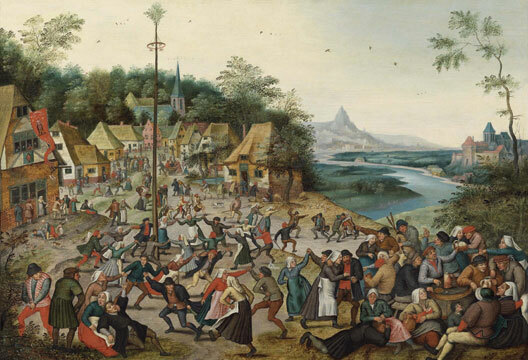 Out of numerous dancing outbreaks, a notable one struck Strasbourg, Alsace in 1518. It all began when a woman started dancing in the streets for around four to six days. Thirty-four other people had joined her within a week, making the count to four hundred in a month. Some suffered heart attacks or strokes, and many others died from sheer exhaustion. This case caused the death of around fifteen people a day. The hysteria remains unexplained. In 1378, hundreds of people along the valley of the river Rhine were affected by a strange affliction, compulsion to dance. Groups of people began to dance frenetically until they collapsed from exhaustion. Just within weeks, this frenzied attack spread over large areas of north-eastern France and the Netherlands halting only after several months. The next notable outbreak happened in July 1518, in Strasbourg (Alsace). It started with a woman named Mrs.Troffea dancing in the streets of Strasbourg for around four to six days. She was later joined by 34 other people within a week, predominantly female. By the end of the month, 400 people were dancing. Some of the people eventually died of heart attacks, strokes, and exhaustion, killing around fifteen people a day. In 1637, a tulip-specific virus called “Tulip breaking virus” caused multicolored flame-like streaks to appear on petals. Tulips that were originally a coveted luxury item, enjoyed a twenty-fold increase in price in just a month because of the rarity of petal patterns. One tulip bulb (Semper Augustus) was reportedly sold for an equivalent of $10-15 million. The “Tulipomania” was recorded as the first economic bubble. Tulips were a unique precious flower among the Dutch mainly because of the novelty, a saturated intense petal color that no other plant had. Hence, they were a coveted luxury item among people. In 1637, multicolored flame-like streaks started appearing on the petals. The color patterns came in a wide variety, increasing the rarity of an already unique flower. Thus, tulips, which were already selling at a premium, began to rise in price. This rare theme of colors was because of a type of tulip-specific mosaic virus, known as the “Tulip breaking virus”, so called because it “breaks” the one petal color into two or more. The true bulb buyers began to fill up inventories for the growing season. The stocks were depleting quickly, increasing scarcity and demand. In no time, the prices of tulip bulbs increased so high that people started trading property, life savings, and anything else they could liquidate to get more tulip bulbs. Many Dutch people sold their hoard to hapless and unenlightened foreigners, thereby gaining enormous profits. In the Chekiang province (1768), people reported that their queues of hair and parts of clothing were clipped by supposed soul stealers. Buddhist monks and beggars across the country were beaten and interrogated out of fear that they might be soul stealers, trying to harness their life-energy. Even the emperor got involved and escalated the fear by ordering the bureaucratic officials to investigate it further. In 1768, villagers of Chekiang province reported that their queues of hair and parts of their clothing were clipped by supposed ‘soul-stealers’. It was reported that the soul stealers would speak incantations over them, thereby gaining control over their spirit. Mass hysteria occurred, as people of all levels of society were horrified. Outsiders who were suspected of this witchcraft were arrested and tortured, and some were killed. Buddhist monks and beggars across the country were beaten and interrogated out of fear that they might be soul stealers. The scare culminated as rumors spread to other provinces. Though officials in Chekiang, Shantung, and Kiangsu decided to dismiss the rumors as irrelevant, the news of sorcery eventually came to the attention of the Ch’ien-lung Emperor. During middle ages, a convent of nuns began to meow like cats and others followed them until all would meow together at a certain time for several hours together. The nuns finally stopped meowing when the police of surrounding village ordered a large group of soldiers to beat them up. During middle ages, a nun in a large convent began meowing. Soon after some time, other nuns joined her too. At last, all the nuns meowed together every day at a certain time for several hours. The neighbors could hear the collective caterwauling and were understandably annoyed. The meowing didn’t stop until they were informed that a large group of soldiers was placed by the police before the entrance of the convent. Nongqawuse, a Xhosa prophetess, reported that she had seen spirits of their ancestors (April or May 1856). It is believed that the spirits had told her that they would drive all the white settlers into a sea. But as a token of faith, the spirits wanted all of their crops and cattle to be destroyed first. This hysteria resulted in famine and death of 400,000 head of cattle. Later, Nongqawuse was arrested. In April or May 1856, Nongqawuse went to fetch water from a pool near the mouth of the Gxarha River. When she came back, she reported that she had seen spirits of their ancestors. It is believed that the spirits had told her that they would drive all the white settlers out of the country. A huge wind would blow all the settlers into the sea. Nongqawuse claimed that before anything could happen, the spirits had told her that Xhosa people should destroy their crops and kill their cattle, the source of their wealth as well as food, as an act of faith.